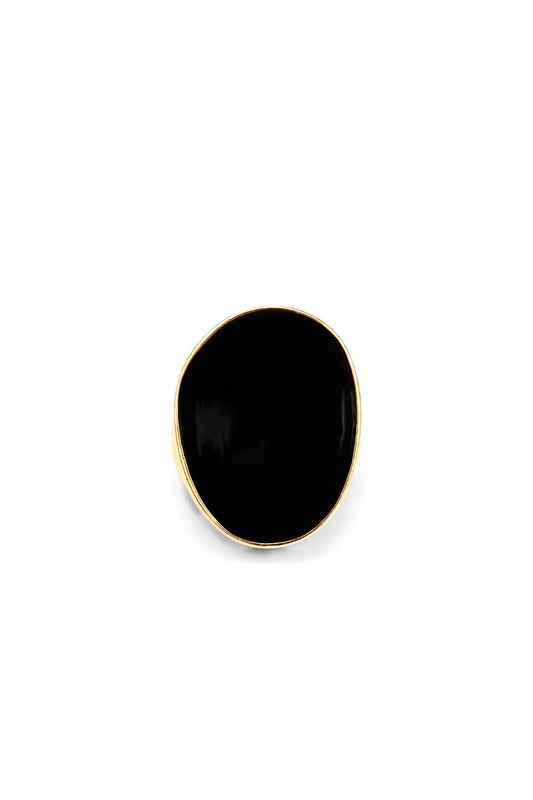 This deep, dark oval ring by Kenneth Jay Lane will add an element of mystery to your formal look. 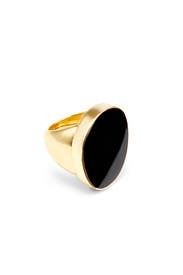 Gold plated statement ring with circular black enamel component. Hidden sizer fits ring size 6-8 comfortably. It perfectly completed my outfit for a pre-Valentine's Day party! I didn't need any other jewelry. The ring is adjustable and is really beautiful! I liked this a lot. Solid and expensive-looking. 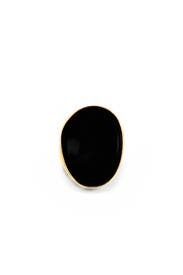 Very deep, glossy black with just a thin rim of gold. There is an adjustable piece inside that helps with fit; it was still a bit big for me (size 6 middle finger), but the jewel part was large enough that it didn't slide or shift. Wore with multiple outfits over the weekend. Thanks RTR! The perfect accessory. I wore it dressed down with skinny jeans & a dress jacket; worn on a different night with a little black dress. A little heavy, but I love a chunky ring! Having it all fit just right! The ring is gorgeous!!! Can't say it enough. It ring just right and I was able to switch it around all night and it looked stunning everywhere I put it. It complemented my outfit just right. I didn't want to return it!! This was a great accent to my outfit. Wish I could have picked a ring size. Only fit me on my index finger which was fine but not ideal. 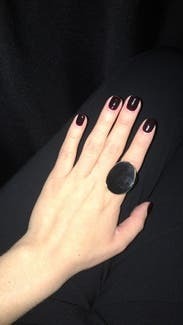 Wore this ring with a formal short cocktail dress. Really made a statement considering how my sequined dress was pretty dominant. The simple lines of the ring were spectacular. Could not wear, did not fit.....I've rented before and they must have sent me a smaller size last time. Should be able to choose ring sizes as an option. Can not name just one. The ring was way to big for all of my fingers. But I found a way to make it work! This ring is so versatile and will go with anything in your closet.. Wear this as a trendy addition to your work outfit and keep for drinks after! Great weight without being too heavy! Loved this ring! So this was unfortunately WAY too big for me. I wear a size 5.5 ring on my ring finger and a 6 fits nicely on most my other fingers. This did have little tongs inside it that you could pinch together a bit to help it fit. Unfortunately it just kept falling off my fingers so I decided to not wear it. It is very cute, just not if you have skinny fingers. Great statement piece. Deep black, gold sides. A bit bigger than I expected. Only fight on thumb or pointer finger. great ring...makes a statement for sure. Just sad it didn't fit. This ring was not adjustable as it states in the description. It fits like an 8 and I am a 6 so was unable to wear it! Very disappointed as it is an amzing ring and would make quite a statement! Loved it and got compliments. Will get again with a great simple black dress and it really stands out. 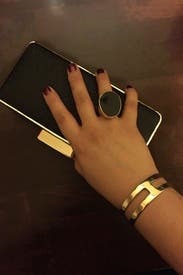 Nice ring, worked well with the other black and gold jewelry I wore. A very large ring! It only fit on my index finger, and then only just. I had to be careful to make sure that it didn't slip off. I usually wear a size 7 or so on my middle finger, 6.5 on my ring finger. 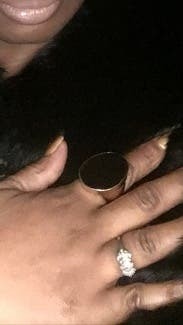 Way too big, the ring has to be at least a size 10. Was not able to wear it out to my event. 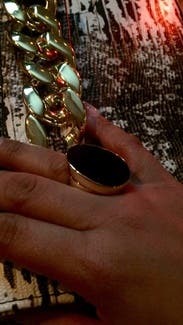 amazing and cool ring, a little large for my short fingers but I wore it any way and got compliments all night! Funky feel while still feeling classy. I loved this ring. It felt great on my finger and gave my outfit just that extra "umph" that I wanted. Loved this ring in person!! I was in the store picking up earrings that I rented when I spotted this ring. I had looked at it online but didn't pull the trigger, however, after seeing in person... I decided that I definitely had to have it for my dress. It added a little bit of edge to my wedding attire while still being chic and clean. My dress was patterned, so this was perfect. Would be great with a going out look too if you are looking for something a little different. It was soon cute. Didn't need any other rings with it!!! Great statement piece for a dress with a high neckline! Definitely a statement peice, but not gaudy or too much. Love this ring so much I kept this one! Fun statement piece to add a bit of flair to an outfit. Large ring - loose on middle finger but still looks good.